What began as a tantalizing rumor has just become an astonishing fact. 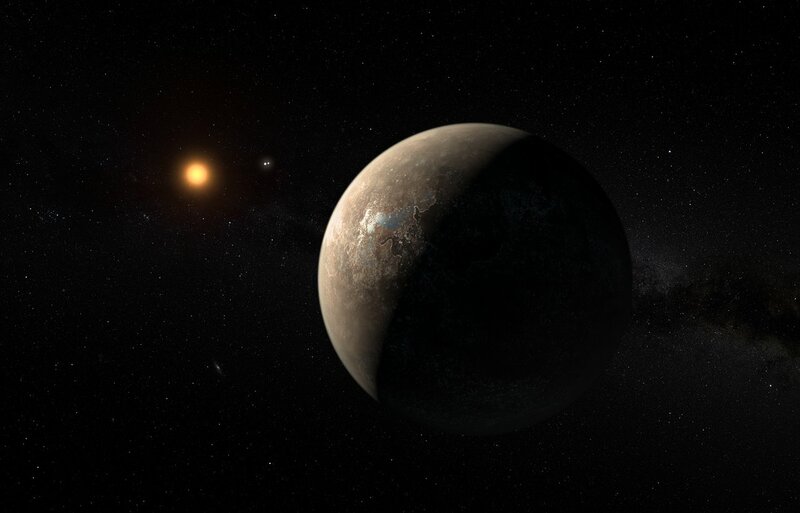 Today a group of thirty-one scientists, led by Guillem Anglada-Escude at the Queen Mary University of London, UK, announced the discovery of a terrestrial exoplanet orbiting Proxima Centauri. The discovery of this planet, Proxima Centauri b, is a huge breakthrough not just for astronomers but for all of us. Here’s why. 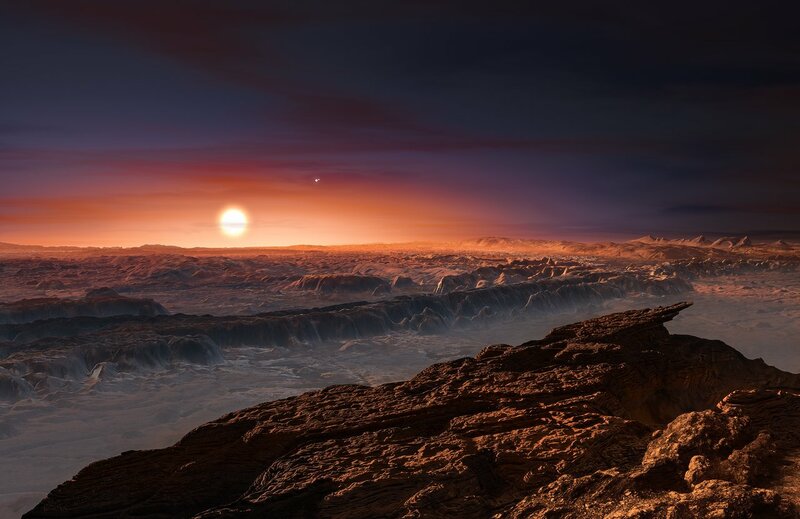 This artist’s impression shows a view of the surface of the planet Proxima b orbiting the red dwarf star Proxima Centauri, the closest star to the Solar System. The double star Alpha Centauri AB also appears in the image to the upper-right of Proxima itself. Proxima b is a little more massive than the Earth and orbits in the habitable zone around Proxima Centauri, where the temperature is suitable for liquid water to exist on its surface. Astronomers know that exoplanets, or planets in orbit around stars other than our own, are numerous in our galaxy. NASA’s Kepler Space Telescope, which spent four years staring almost continuously at a tiny, distant patch of the sky, proved that there are on average two exoplanets per star in the Milky Way. That’s a lot of worlds! Kepler has also shown that most of our galaxy’s planets are indeed terrestrial—that is, like Earth or even bigger (so-called “super-Earths”). Unfortunately, the exoplanets discovered by Kepler are very distant—too far away for us to observe (and thereby study) using techniques available to most scientists today. 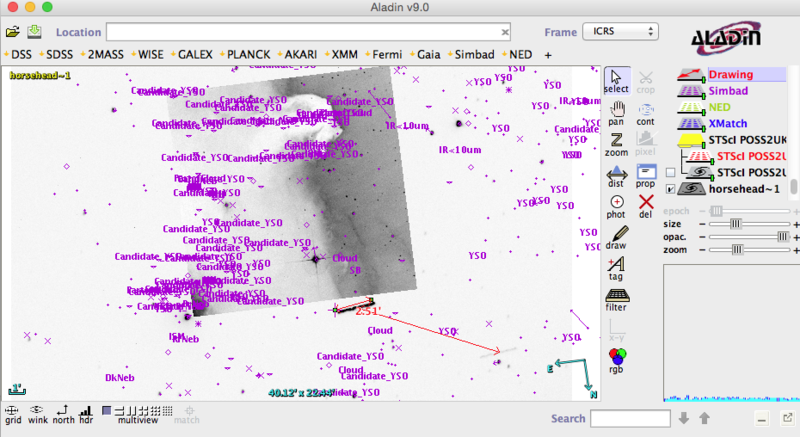 But Kepler is not our only tool for finding exoplanets. We can also use the radial-velocity method, which involves looking for the wobble a planet induces in its host star. This is an effective way to determine the mass of the planet and is not used only for distant stars. In the year 2000, for example, two astronomers announced the discovery of Epsilon Eridani b, a Jupiter-like exoplanet that we now call Aegir, orbiting around Epsilon Eridani, a bright star that’s only 10 light-years away. It was, until today, the closest exoplanet known. Now we know of one that’s far closer. We also know of 3,374 exoplanets, an enormous large number, given that we discovered the first one only in 1995. Like the cartographers of the seventeenth century, who slowly build a map of our world, astronomers are drawing a map of our galactic neighborhood. We think we have a good handle on the location of nearby stars—that is, ones that are less than 50 light-years away. We know their distance size, temperature, and if they are multiple systems or single stars, for example; but ultimately what we would really like to add to this 3D map of the galaxy are the planets in orbit around these stars. The Pale Red Dot group was particularly interested in finding planets around Proxima Centauri, the star closest to the Sun. Proxima Centauri is only 4.25 light-years away, so it’s literally in our cosmic backyard. Because of its small mass, it’s too faint to be seen with the naked eye, and was discovered only in 1915. At the end of the 1990s, astronomers tried to detect potential large planets in orbit around this star using the radial-velocity method and came back empty-handed. In the article published today in Nature, a group of modern astronomers reported on what they learned by using two high-precision radial-velocity instruments: HARPS at the 3.6m telescope of La Silla and UVES at the VLT 8m class telescope, both part of the European Southern Observatory. Several of these observations were done as part of other programs that took place between 2000 and 2016, but from January 2016 to March 2016, the team collected what we call high-cadence data, a fancy way to state that the star was observed once per night to increase its chance of detecting a tiny variation in its motion o (~1 m/s, or the speed of a human walking) that might be caused by the presence of a small planet. This artist’s impression shows the planet Proxima b orbiting the red dwarf star Proxima Centauri, the closest star to the Solar System. The double star Alpha Centauri AB also appears in the image between the planet and Proxima itself. Proxima b is a little more massive than the Earth and orbits in the habitable zone around Proxima Centauri, where the temperature is suitable for liquid water to exist on its surface. This ambitious program has paid off beyond our wildest dreams in that we have now unambiguously detected a planet with a minimum mass 1.3 times that of Earth orbiting the star right in the middle of the goldilocks zone (0.05 AU). I am not a specialist in RV measurement, but this detection seems quite convincing in that it has a false-alarm probability of less than 0.1% and uses a careful comparison of star activity (done by using additional small telescopes during the survey) that are known to mimic the signal of a planet. That is a very significant new data point to add in our cosmic map. Did we find a terrestrial planet? We don’t know for sure. The planet’s MINIMUM mass is 1.3 x Mearth since we don’t really know the orientation of the orbital plane with respect to the observer (RV provides a measurement of m sin i, with i the inclination of the system with respect to us). Assuming random orientations of orbital planes, we have a 90% probability that the true mass is < 2.3x the minimum mass, so 3x Mearth. In short, this could be a super-Earth or something more exotic, like a baby-Neptune. Have we found a cousin of Earth? Not yet. We don’t know the composition of the planet—keep in mind that we haven’t seen it but only its effect on its star. Consequently, we don’t have much information on the planet itself, but we do have a constraint on its mass (see above) and its orbit (one year of Proxima Centauri b is 11.2 days). Since the planet does not transit its star, we don’t know yet its size, hence its density. Can life exist on this planet? The planet is at the right place to have a temperature that allows the presence of liquid water on its surface. The question of habitability is however very complex. We need to confirm that this is a terrestrial planet. The best way to do that would be to directly image the planet using the giant telescopes equipped with extreme adaptive optics that are currently being built (i.e., the E-ELT, TMT, GMT). The angular separation between the star and the planet is 39 milli-arcsec, so a telescope as large as 30 m could resolve the system with the right instrument, detecting the planet and possibly giving us insights into its composition. Can life thrive on this planet? This planetary system is different from ours. Proxima Centauri is a M-type star that is known for sporadic flares, or outbursts of energy. Those luminous UV and X-ray flares could have sterilized the surface of the planet regularly and/or ejected a significant part of its atmosphere into space. The authors briefly discussed the possibility of habitability given the possible presence of an extreme environment. I am betting that several follow-up papers on this topic will be published very soon. Astrobiology has taught us that life on Earth is resilient and can be found in extreme environments like deep oceans or protected from UV light in underground caves, so the possibility of a life somewhere in Proxima Centauri b cannot be rejected. Ultimately, this discovery is a significant step on the road to mapping our galaxy. 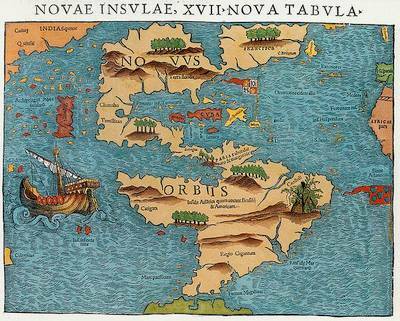 And it has given us a new world to explore, and one that is not too far away. We may not go there any time soon, but it will motivate us (and our funding agencies!) to design and build instruments to image and characterize this planet. What could possibly be more exciting than, in the not-too-distant future, getting a picture of a terrestrial planet whose atmosphere we can see and on which we could possibly detect signatures of life? That monumental moment may come in the next decade, and will definitely happen faster now that we know where to point our telescopes. Let me close by saying that it is astonishing that we were able to detect this small planet after only three months of observations. The Pale Red Dot group is planning similar campaigns for other nearby stars. In the future, for example, we may know if Alpha Centauri A and B, another nearby system composed of two stars almost identical to the sun, host a true cousin of the planet we call home. We have no way of knowing where this quest will go, or when, or what it will find. But clearly, this could be the most astonishing journey in the history of humanity. This is so cool. As an old fool in his sixties who has watched and been involved in astronomy and space exploration. I am thankful I have lived to see this day. Clear skies and 73. The Cenos ET Aliens have long been suspected to be from planet in the Proxima Centaruri star system. This analysis suggests that the The Cenos ET aliens were perceived as (8.0′ to 8.5′ tall) human beings 4300 years ago, but the ET aliens are more likely depicted by this recent image from Taiwan. An 8’+ tall alien with webbed hands that was spotted in Taiwan in December has been determined to be real! The following videos and pictures show three different media reports out of Taitung, Taiwan. The videos feature the rather strange sighting of an “alien being”. In going by the translation of the original report, the sighting took place near a body of water known as Jiaming Lake. Experts at the Taiwan Unidentified Flying Object Society (TUFOS) measured the ‘alien’ to be approximately 8.2 feet tall. The ‘alien’ had webbed hands, nearly completely transparent skin and his head was quite similar to the head of a praying mantis. TUFOS experts concluded that the alien being had come from an underground alien base in the vicinity of the lake. Sitchin’s famous Akkadian seal was recovered from the Cenos aliens previous visit to Earth circa 4300 years ago. This may be our Planet Nine or Planet Ten astronomers are now searching for in our solar system. Further, it also implies that there is another Jovian like planet in our solar system (our Vulcan) of 141 +/-35 Earth masses. Similar Vulcan masses have been deduced by other means; 166 Earth mass and [333,000(Sun mass in Earth masses)] X [0.35 Earth Orbit radius from the Sun (Bary Center)]/[ 447.6 – 0.35] = 261 Earth Mass. Very inspiring post. It really motivates to live forever and to follow all steps to colonization other planets. It’s exciting to know the possibilities 🙂 . because i am a professional article writer and also an excellent experienced communicator with wide cross-cultural experience, My primary interest/speciality areas are education, health,business and medical. although I have written successfully on a wide variety of topics. which make My clients appreciate my ability effectively with wide range of requirements, and I take great pride in ensuring that you are completely happy with my work, otherwise the project is not finished.